"Welcome to a new YA series that reimagines classic Disney stories in surprising new ways. Each book asks the question: What if one key moment from a familiar Disney film was changed? This dark and daring version of Aladdin twists the original story with the question: What if Jafar was the first one to summon the Genie? 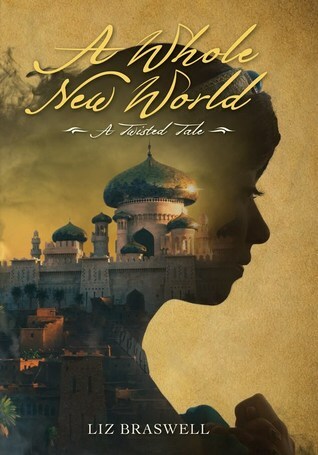 A retelling of Aladdin, A Whole New World tells the tale of what would happen if Jafar got ahold of the lamp and genie instead. While I was initially shocked and appalled at how the first 23% of the book was word for word and action for action exactly like the Disney movie, I’ve gotten over it. I’ve realized that the author did this to re-familiarize the target audience with the classic to better set them up for the plot twist, and that since Disney is the publisher of which they obviously didn’t have a problem with it, why should I? I do, however, wish the author took a little bit more creative freedom with this task. When the twisted tale finally started to happen, my interest increased as more suspense kept me pinned to the story. It definitely took a dark turn, as it told of just how far an evil man like Jafar was willing to go. The question becomes not just how far will Jafar got with his three wishes, but can he find a way to break the Genie’s rules and limitations? Agrabah is going through many changes as they surge from a sultan who couldn’t care less about them, to a sultan who would do anything for their devotion and allegiance. A war is brewing as Aladdin, Jasmine and the Street Rat army vow to take back their city from the vicious clutches of Jafar and his minions, but how can a measly pack of thieves fight against a tyrant sorcerer brimming with magic? I enjoyed reading this book, not only because it was thrilling and easy to read, but because it brought me back to my childhood of watching the Disney classic and singing along. It was fun to see this story in a new light with a great twist, as it felt like Aladdin meets Assassin’s Creed. I would recommend this story for middle-grade to young adults who like a little thrill and action with a familiar setting. Awesome! Yeh, although the beginning may have irritated me at the time, I got over it as I read on :) I hope you like it too!